Mosheh ben Maimon, better known in the west as Maimonides, was one of the most famous Jewish philosophers and physicians of the Middle Ages. One of his many works was On Poisons and the Protection against Lethal Drugs, which he wrote up as a quick guide on dealing with animal bites and poisoning. The treatise was written in 1199 at the request of Saladin’s secretary, and proved to be very popular for centuries afterwards. Here is some of the advice that Maimonides gives on poisons. I say that any plant or animal meat which a person finds tasty, that is, sweet and good smelling, is undoubtedly appropriate nourishment and may be eaten safely. But all the foods with different tastes, such as bitter, acrid, sour, and other tastes, and, similarly, all those with a bad smell, one should not taste until one has verified what species they are. For there is a sharp tasting plant that one may think is wild radish, while in reality it is a deadly poison, and similarly, there is the fruit of a roundish plant that resembles truffles and changes its color into black but is fatal. Someone who wants to guard himself against someone else whom he suspects should not eat from his food until the suspect firsts eats a fair quantity from it. 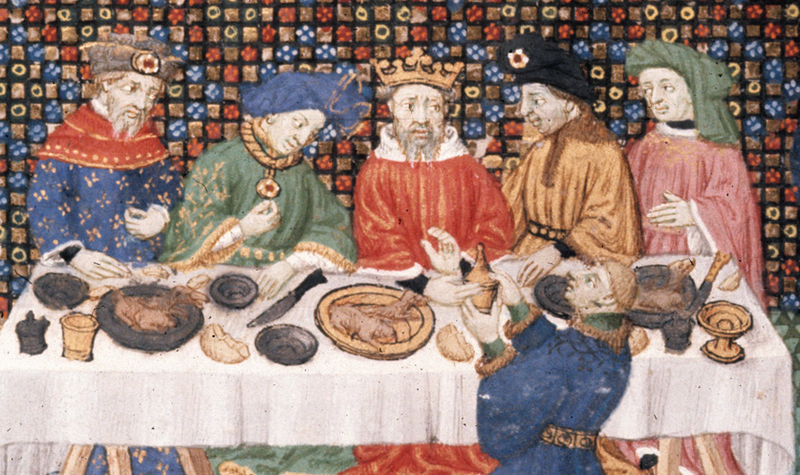 He should not be satisfied with eating only a mouthful, as I have seen done by the cooks of kings in their presence. Assassination can also be easily effected by throwing poisons into wine, for wine is especially appropriate because it hides the color, taste, and smell of the poison put into it and also assists in the poison’s reaching the heart. And if someone also takes wine when he knows that they want to assassinate him, he has undoubtedly lost his power of discrimination. Anyone who took poisoned food or suspects that what he took was poisoned should first of all hasten to vomit the food by means of hot water in which aneth has been cooked and over which much olive oil has been poured. He should drink it lukewarm and purge everything that is in his stomach therewith. Then he should drink a large quantity of fresh milk and vomit it. Then he should wait awhile, drink more fresh milk, and vomit it. Then he should wait awhile and drink milk and fresh butter and vomit it. It is said that excrements of roosters have a specific property to eliminate every poison by vomiting. The best simple remedy is the emerald; it is an excellent theraic for every poison one takes and for every poisonous animal bite. Moreover, it has the specific property of strengthening the heart, if kept in the mouth, and it good for pain in the stomach if it is hung on the stomach from the outside. I have already said before that I will only mention those substances of the kind that one can eat without knowing their specific nature or with which one can easily assassinate someone. Among these is ox blood, and it is easy to assassinate someone with it if one mixes it into a dish to thicken it or into an omelet prepared with meat; it is a deadly poison. We find that some men are assassinated by their women by means of the food they take and die after one day or some days, or suffer what is far worse than death, namely suppurating elephantiasis, which results in the limbs falling off…the substance with which they had tried to assassinate their husbands was menstrual blood that they took from the beginning of the menses – even a small amount – which they put into the food and which then caused the observed afflictions. It is easy to assassinate someone with hemlock and henbane. When a person knows that this is the case, he should hasten to take some bark of the mulberry tree, boil that in vinegar, and first induce vomiting with that and then milk. Among the substances that are eaten without knowing their nature are truffles and mushrooms. These two types of food are extremely bad and are eaten in large quantities by the people of the West and Syria-Palestine. Each of them has a deadly variety, namely the variety that has a black color, or a green color, or that smells bad. But even the safe variety of these two types, if used for a long time, produces angina, which leads to death or a severe colic. If someone eats this safe variety, he should add much pepper and salt to it and drink much undiluted wine after it. As for the fatal variety of these two types, someone who has eaten from it should – as soon as the symptoms develop in him – be quickly given to drink one ounce of barley gruel, two dirhams of borax, and half a dirham of Indian salt. He should wait until this has settled in his stomach and then vomit it. Then he should drink oxymel with juice of radish leaves and vomit it. And then he should be given to drink vinegar and salt and vomit it. Then he should drink a large quantity of milk, wait for an hour, and vomit it. Then let him drink pure wine little by little. We often prescribe black nightshade juice among the ingredients to be taken for diseases of the internal organs. One of its varieties that has black seeds and that is soporific is sometimes taken by mistake when the seeds are still green, before they turn black. Upon drinking, it immediately causes severe dryness, hiccups, and vomiting of blood. Its treatment: hasten to let him vomit by mean of the general emetics that have been described before. Then let him vomit got the last time by means of water and honey. Then let him drink a large quantity of water and honey. When he has digested something of it, he should take another drink of the water and honey. He should do so for a day and a night. And then he should feed himself as usual. Maimonides’ On Poisons and the Protection against Lethal Drugs has been edited and translated by Gerrit Bos. It was published by Brigham Young University Press in 2009. Click here to learn more about this book.